Diamètre: 75mm. ● Idéal pour la récupération de matériaux sous-marins contenant du nickel contenant du fer et Bonne idée pour les applications de pêche, de levage, de suspension et de récupération des aimants. 1 Pinpointer. - The alarm will be increased based on targets' proximity. - Indicator: proportional audio / vibration pulse rate. - Scraping blade for searching among tight soil. - One-touch operation. Indicators: Proportional audio/vibration pulse rate. Proportional audio/viration pulse indicates targets. Battery Life: Carbon: 16 hours. Battery: Single 9V (not included ). 1 x Belt Holster. LED light for low light uses. 1 x Belt Holster. Tuning: Automatic. Battery Life: Carbon: 16 hours. 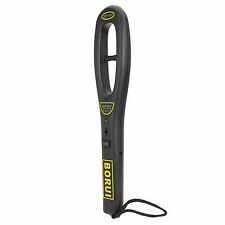 Portable, durable and easy to use. Automatic turning. Scraping blade for searching soil. LED light for low light uses. 360°side-scan detection area. C’est un détecteur de métal portatif compact qui va vous aider avec votre chasse au Trésor. Il a une conception IP66 durable qui le rend résistant à l’eau, gouttes et la poussière. Pour cette raison, vous pouvez l’utiliser dans n’importe quelle condition météo. El 30-ene-19 a las 04:55:36 H.Esp, el vendedor añadió los siguientes datos 1 x Belt Holster. Battery Life: Carbon: 16 hours. Portable, durable and easy to use. Automatic turning. Scraping blade for searching soil. 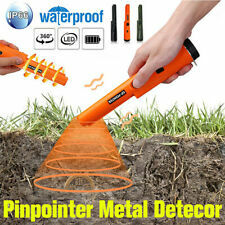 3-10ft detection depth allows you to detect treasures that buried deeply in the ground. Furthermore, you can also use it in shallow water. If you do not receive our reply within 48 hours, pls. If you are satisfied with our service, pls. It incorporates new firmware algorithms to help find your target fast, and retain all the previous models advanced features which include TheVibra-Tector ™ incorporates Pulse Induction (PI) technology. La coque en acier est cruciale pour l'amplification de la force magnétique. & nbsp; & nbsp; & nbsp; & nbsp;. - Idéal pour toutes les applications de pêche, de levage, de suspension et de récupération des aimants! Hay un ajustes de sensibilidad de modo 8 de profundidad de moneda, 5 modos de juego caza del pre y la más avanzada pantalla gráfica de LCD para una identificación fácil y rápida de la blanco. 1 x Detector. 24" Sand Scoop - Knee High. The handle is 24" and the bucket size is 5" x 7.5". Great detector. This is the "Gold Bug" series and in very good condition. Adjustable shaft. Oval head. Headphone jack. 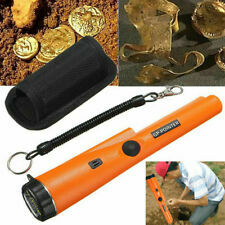 With four find modes and Minelab's. Easy-Trak technology you can start searching and uncovering finds without the need for complicated settings. WithWireless Audio via Bluetooth® you won't need to be tethered to your detector. 1 x Belt Holster. Battery Life: Carbon: 16 hours. Tuning: Automatic. Automatic turning. LED light for low light uses. USA, Canada, United Kingdom, Austrilia, France, Germany, Spain, Ireland, Italy, Others. Try this one. Also note that monitor settings may vary from computer to computer and may distort actual colors. We believe that everything could be solved by communication. Sensitivity: A25 cent coin detected 65mm. Alarm mode: sound and light synchronization alarm. The alarm mode has two alarms: sound and light, vibration. Working temperature: -10°C-50°C. We believe that everything could be solved by communication. Originally bought July 2015. This is in great clean condition. The carrying and accessory bags have never been used. Originally bought from KellyCo, a great vendor. (all pictured). We cannot do this for you. Reference number. Indicator: proportional audio / vibration pulse rate. The alarm will be increased based on targets' proximity. With a holster and a retractable hanging wire. Power: 9V battery(not included). LED light for low light uses. LCD display. Light weight and easy operation. Detail Image. Frequency: 55.3KHz. Power: 9V(6F22) (NOT included ). Weight: 0.495 kg. Color: Black. Funktioniert soweit ich es beurteilen kann. Nur grob gereinigt. Damit Sie wissen bei wem Sie kaufen. - Abholung ist auch gerne moeglich, allerdings nur nach vorheriger Absprache. - das ist das Gesicht hinter richyleo. Nokta | Makro Detectors are advertised and sold in almost 100 countries word-wide. Nokta | Makro knows what it takes to find treasures! The New Nokta | Makro Pointer is the perfect detecting tool for the thousands of treasure hunters who search on land and in water. 1 Pinpointer Holster. High sensitivity makes sure the accurate detection. New! 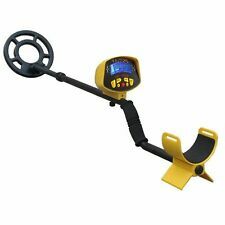 Garrett Ace 400 Metal Detector w/ Submersible Coil Free Accessory Bundle. Condition is New. Shipped with USPS Priority Mail. Sensitivity: A25 cent coin detected 65mm. Alarm mode: sound and light synchronization alarm. The alarm mode has two alarms: sound and light, vibration. Working temperature: -10°C-50°C. Handheld and light weght,easy to use. Never really got to use the detector. May 27, 2014Got my R1 and it rocks, a week ago now, so happy I opted for it. It is a belter of a machine, and is a doddle to set up and use. remark: only availaible with English manual. Just turn on the power switch. Use of the Transmitter The intersection of the two directions is the buried position of the target. 2, regulate your scanning action. First, let the receiving antenna stretch properly. VIKING VK30. Takes 1 x 9v battery. It's intended to be used in salt water and minralized ground. The headphones are part of the unit as they cannot be detached. Just bought this coil new and used it once, too small for what I need it for. I am including a lower rod with it that was also only used once. Also includes coil cover.